Slicetruck: Is Slicetruck New York (style) Pizza? Is Slicetruck New York (style) Pizza? No, our pizza is not made in New York, AND after all the different pizza I've had in New York, I'm not sure what specifically people are referring to when they refer to New York pizza or tell me that we don't quite have New York pizza. 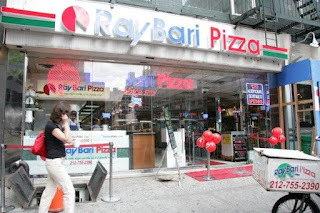 I've had great Neapolitan style pizza baked in coal and wood ovens and I've had a some great pizzas that were hand tossed and cooked in classic deck ovens while being on New York City ground. These are both very different styles of pizza and I can't figure which one would be "New York" but where I'm really going with this is that for every great pizza place I've been to in New York I've been to 40 that are completely unremarkable and often times terrible. ALSO it should be noted that there are no shortage of Domino's, Papa John's and Pizza Huts in Manhattan along with the other 4 boroughs. Are these New York pizza? Sbarro's was started in New York and became quite an operation while positioning itself as "mall pizza". Is Sbarro's New York pizza? After all this nonsense I'm writing I will say this; the top 10% of pizza in New York is better than the top 10% of pizza in any other city in the United States. I'd bet it goes for the world too. However I've never traveled Italy, so really I have no idea. I haven't even really traveled the United States. The point is that its silly when people talk about New York pizza being so great or the pizza "back east" as if every place is great. Its not. Similar greedy people are in New York and California making pizza with the cheapest ingredients possible trying to make the largest profit margin off each pizza sold. This is BY FAR the majority of all pizza places in the country. Everything boils down to money. I don't know but I would bet California Pizza Kitchen had better pizza before it was bought out and rapidly expanded. It gets bought and then they do some taste tests, "this cheese tastes the same as this cheese and its 30% cheaper" done, change it. "This sauce recipe tastes the same, maybe better and its 50% cheaper" change it. "This oven is easier to use and makes pizzas faster" Brilliant!. I would bet Sbarro pizza was unbelievable before it was bought out the first time.